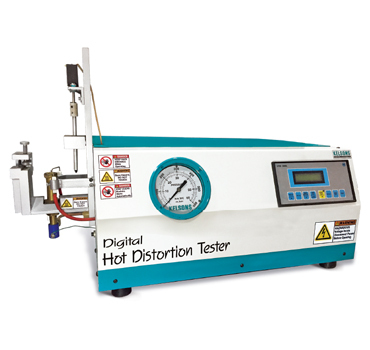 The HOT DISTORTION TESTER includes a Specimen heating system, pneumatic regulator/filter, pneumatic hose and connectors to connect the supplied regulator/filter to the instrument, also includes with PC with HDT Software. The Hot Distortion Tester is electrically operated equipment. It is specially designed for rapidly heating and to measure any corresponding deflections of a standard transverse sand specimen during the heating, Clamp the specimen at one end to their location, second end rest below deflection measurement sensor. Keep LPG pressure 300 mmwc, by pressure regulator. Press start button then Burner flame will start. Software will plot a graph on PC monitor respective to specimen deflection v/s time. The sand specimen will eventually break once the binder is destroyed. The distortion curve can be saved in the internal memory of PC. The distortion curve can verify with the standard curve. Electric Connection : 230 Volts AC, 50 Hz.